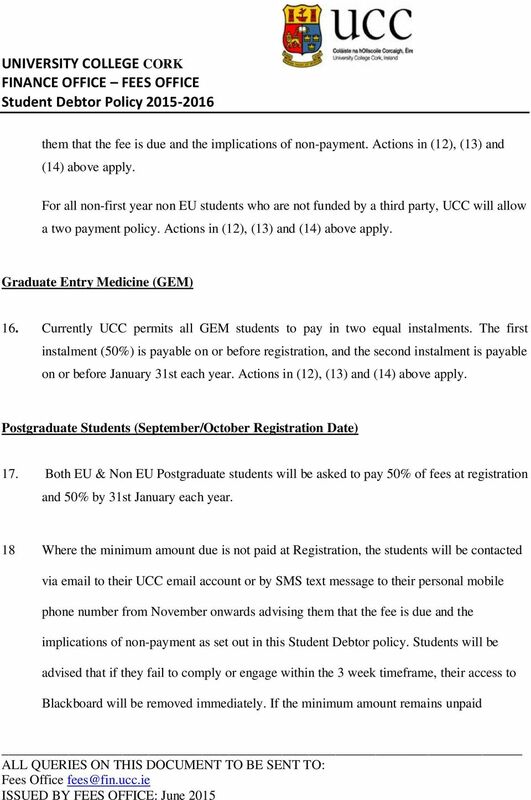 Download "UNIVERSITY COLLEGE CORK FINANCE OFFICE FEES OFFICE Student Debtor Policy 2015-2016"
2 will be contacted via to their UCC account, and by SMS text message to their personal mobile phone number. The Student will be requested to pay the minimum amount as out-lined above, or to contact the Fees Office to agree an alternative repayment schedule. It should be noted that under no circumstances can a payment plan be made for the Capitation Fee of 165. This is payable in one instalment only. Students will be advised that they have three weeks to comply with the request for payment or engagement with the Fees Office. Students will be advised that if they fail to comply or engage within the 3 week timeframe, their access to Blackboard will be removed and their ID cards will be disabled to deny them access to the Library. Cards will be enabled and access to Blackboard will be restored once the Fees Office have received payment or agreed a repayment plan with the students involved. 7. Students will be allowed access their examinations results even if their fees are not paid in full. This is to facilitate student s ability to register for repeat exams and pay the appropriate fee. Students will not be permitted to register for the following year until all fees are paid in full. 8. 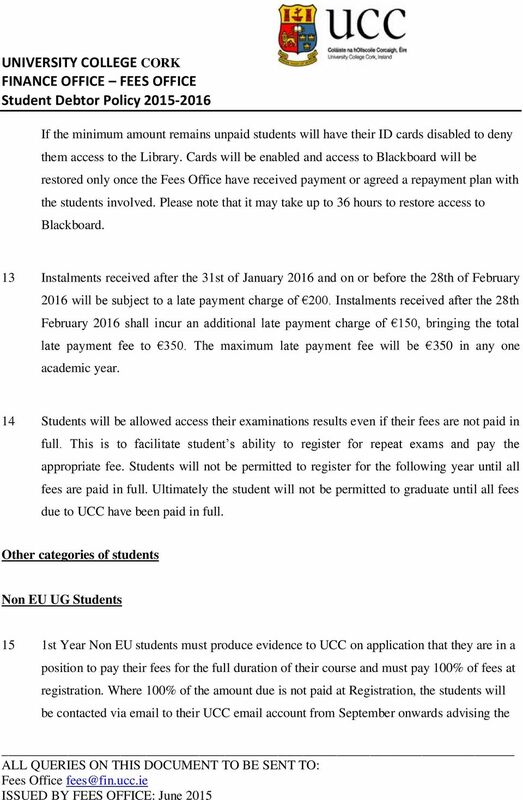 Ultimately the student will not be permitted to graduate until all fees due to UCC have been paid in full. 9. Students should refer to the Fees Office website for details of the University Fee Refund policy. 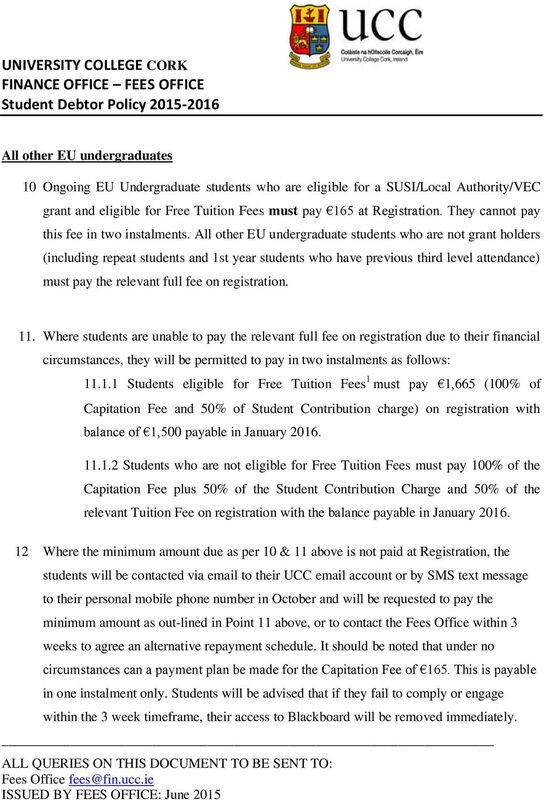 3 All other EU undergraduates 10 Ongoing EU Undergraduate students who are eligible for a SUSI/Local Authority/VEC grant and eligible for Free Tuition Fees must pay 165 at Registration. They cannot pay this fee in two instalments. All other EU undergraduate students who are not grant holders (including repeat students and 1st year students who have previous third level attendance) must pay the relevant full fee on registration. 11. Where students are unable to pay the relevant full fee on registration due to their financial circumstances, they will be permitted to pay in two instalments as follows: Students eligible for Free Tuition Fees must pay 1,665 (100% of Capitation Fee and 50% of Student Contribution charge) on registration with balance of 1,500 payable in January Students who are not eligible for Free Tuition Fees must pay 100% of the Capitation Fee plus 50% of the Student Contribution Charge and 50% of the relevant Tuition Fee on registration with the balance payable in January Where the minimum amount due as per 10 & 11 above is not paid at Registration, the students will be contacted via to their UCC account or by SMS text message to their personal mobile phone number in October and will be requested to pay the minimum amount as out-lined in Point 11 above, or to contact the Fees Office within 3 weeks to agree an alternative repayment schedule. 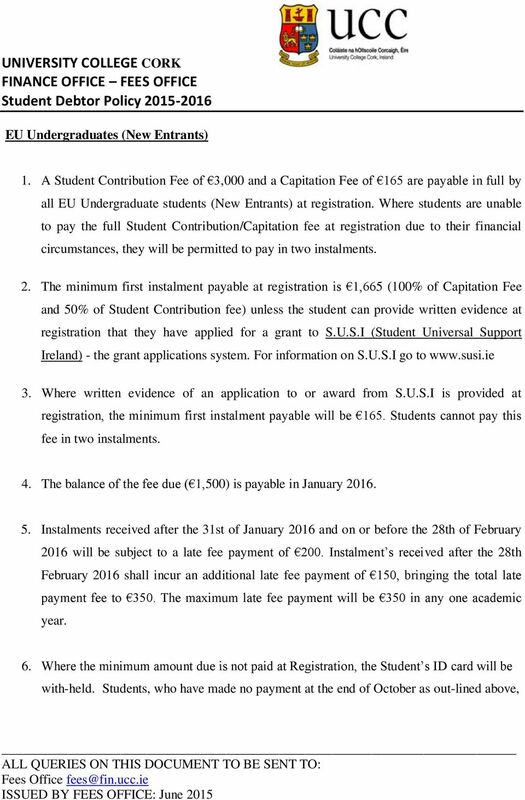 It should be noted that under no circumstances can a payment plan be made for the Capitation Fee of 165. This is payable in one instalment only. Students will be advised that if they fail to comply or engage within the 3 week timeframe, their access to Blackboard will be removed immediately. 6 students will have their ID cards disabled to deny them access to the Library. Cards will be enabled and access to Blackboard will be restored only once the Fees Office have received payment or agreed a repayment plan with the students involved. Please note that it may take up to 36 hours to restore access to Blackboard. 19. Instalments received after the 31st of January and on or before the 28th of February will be subject to a late payment charge of 200. 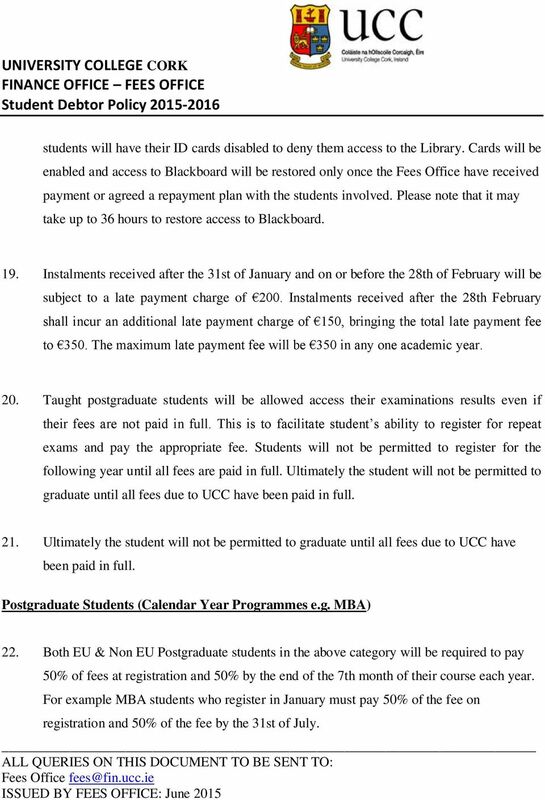 Instalments received after the 28th February shall incur an additional late payment charge of 150, bringing the total late payment fee to 350. The maximum late payment fee will be 350 in any one academic year. 20. Taught postgraduate students will be allowed access their examinations results even if their fees are not paid in full. This is to facilitate student s ability to register for repeat exams and pay the appropriate fee. Students will not be permitted to register for the following year until all fees are paid in full. 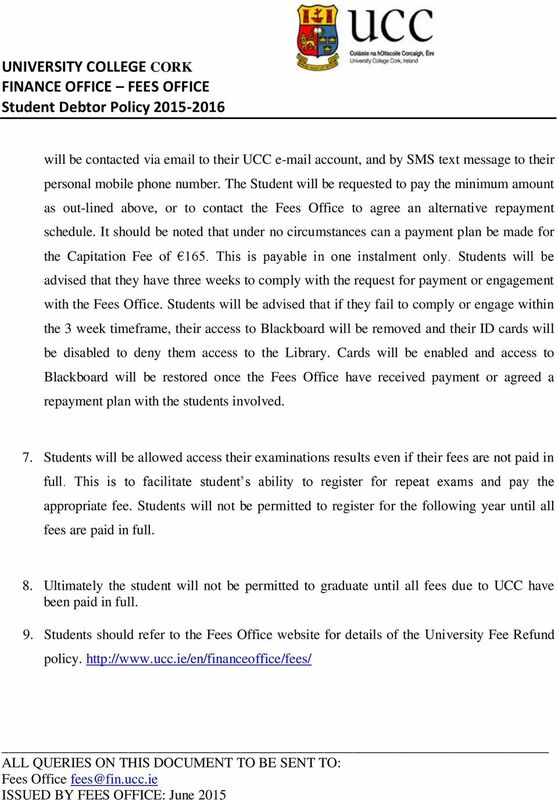 Ultimately the student will not be permitted to graduate until all fees due to UCC have been paid in full. 21. 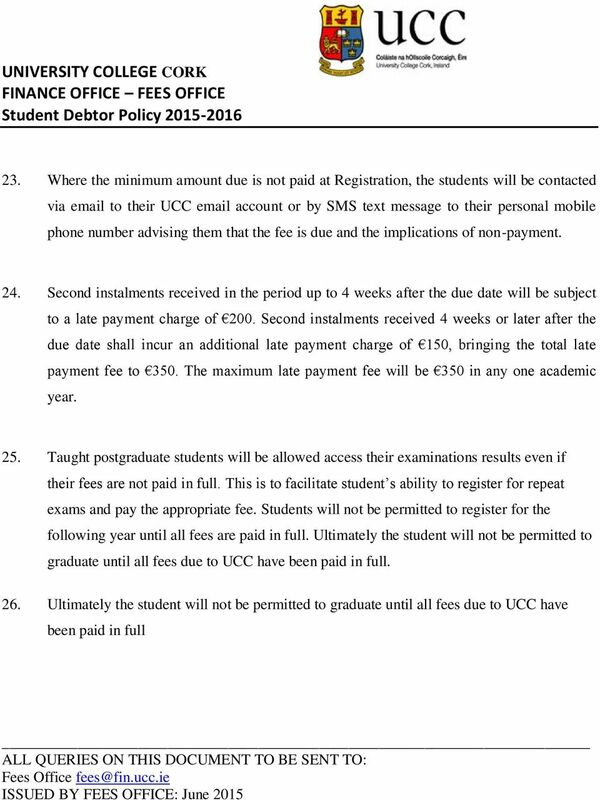 Ultimately the student will not be permitted to graduate until all fees due to UCC have been paid in full. Postgraduate Students (Calendar Year Programmes e.g. MBA) 22. Both EU & Non EU Postgraduate students in the above category will be required to pay 50% of fees at registration and 50% by the end of the 7th month of their course each year. For example MBA students who register in January must pay 50% of the fee on registration and 50% of the fee by the 31st of July. 8 . Other 27. 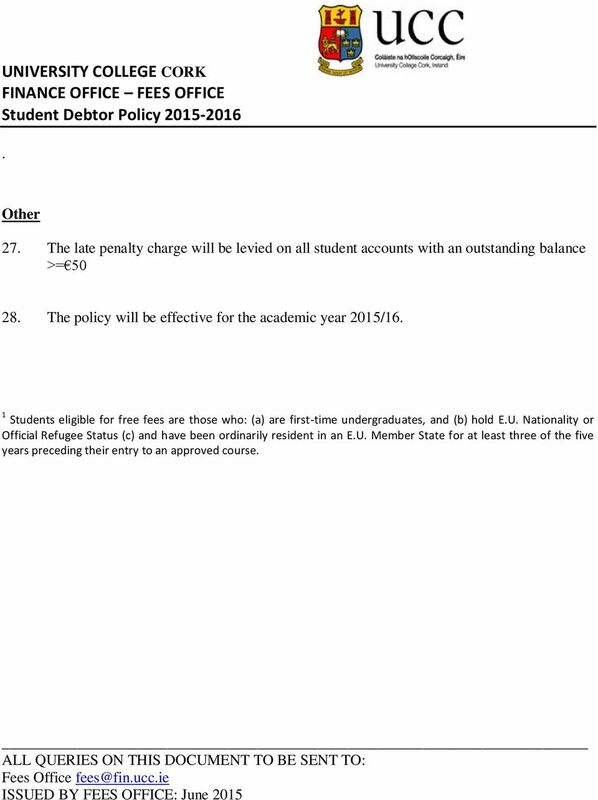 The late penalty charge will be levied on all student accounts with an outstanding balance >= The policy will be effective for the academic year 2015/16. 1 Students eligible for free fees are those who: (a) are first-time undergraduates, and (b) hold E.U. Nationality or Official Refugee Status (c) and have been ordinarily resident in an E.U. Member State for at least three of the five years preceding their entry to an approved course. NYU Tuition Remission Benefit Plan For Employees enrolled in Graduate Degree Programs For Faculty, Administrators, and Professional Research Staff CONTENTS I. Who is Covered Under this Plan?... 3 II. III. Students who receive either a means-tested or non means-tested NHS bursary and NHS secondees are eligible to apply to the Fund. The key themes of the UEL's approach to learning and development are indicated below. APPLICATION GROUP CREDIT INSURANCE OUTSTANDING BALANCE Minnesota Life Insurance Company 400 Robert Street North St. Paul, Minnesota 55101-2098 PRIMARY APPLICANT (First, Middle, Last) SOCIAL SECURITY NO. Student Finance 2016/17 Tuition fees and tuition fee loans Loans and grants for living costs University bursaries and scholarships Costs of living Loan repayments For students currently living in England. MBA allows no more than two loans at a time. Consolidations of loans is allowed. The Department of Education (ED) may use a servicer to handle billing and other communications related to your loan.